From 1776, when Jedediah Strutt built his first mill (the South Mill) on the site, until the early 1990s when the English Sewing Cotton Company finally closed down the modern spinning operations in the East Mill, cotton spinning was carried out on the site of the Strutts’ Belper Mills, a span of over two hundred years. Jedediah Strutt’s original North Mill, completed in 1786, was a timber-framed structure. At that time fire was a major hazard for early cotton factories. In the course of processing, flammable cotton fibre would fill the air and, given that lighting was by candle or oil lamp and some machine processes involved metal parts working against each other and creating sparks through friction, fire was a very real danger. The original North Mill burned down in 1803, without insurance. Jedediah’s son William Strutt designed the replacement mill, which is now home to Strutt’s North Mill Museum. He pioneered a number of innovative techniques including using a ‘fire-proof’ iron-frame, instead of timber. This became a blueprint for future mill construction and in addition was a template for modern skyscraper engineering. The North Mill was in operation again by 1804. It is now a Grade I listed building and forms a key element of the Derwent Valley Mills World Heritage Site. 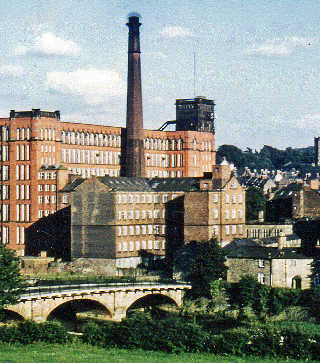 Many of the original Strutt buildings on the opposite side of the road – including the West, Junction and Reeling Mills, plus the curious Round Building – were demolished in the period 1959-66, so the North Mill, East Mill, some additional buildings and the nearby horseshoe weir give just a small idea of the extent of what was once a vast complex and the impact it had on the town. At its zenith, almost 2000 people were employed in the Strutt Mills. Through successive generations the Strutt’s built millworkers’ cottages, chapels, schools and leisure facilities for their workers, creating one of the world’s first industrial communities. A visit to Strutt’s North Mill Museum acts as a gateway to understanding more about the historic town of Belper and how Jedediah Strutt helped to introduce mechanised cotton spinning to the Derwent Valley and in the process transformed Belper into the world’s first cotton mill town. 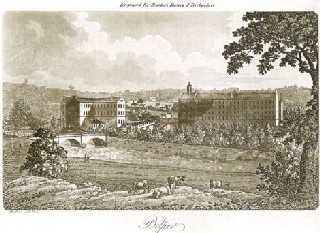 An early view of Belper Mills as they appeared about 1811. The now demolished West Mill. 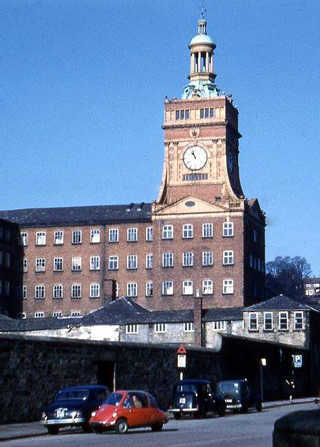 The North and East Mills in the 1960s.